I recently did a gallery walk-though with Lola Montes Schnabel on the occasion of her current solo exhibition in the pop-up of Tripoli Gallery, located at 980 Madison Avenue in Manhattan. The show, titled Within Reach is on view until February 11th, 2013. The full text has been posted in NY Tales my online column for Flash Art International and also posted below. Lola Montes Schnabel is an artist who makes marks on canvas that attempt to translate something through an action that strives to be metaphysical. For her exhibition, Within Reach, at Tripoli Gallery Pop-Up in Manhattan, the artist presents several large-scale oil paintings on linen and a series of framed watercolor drawings on paper. The paintings are the most formally abstract that she has made thus far and much of the information found in previous works has been removed. In the place of semiotic strokes that once left little undeveloped space, now are expansive areas of color. The sea is a buttery shade of yellow, the sky a sanguine red filled with striking blue clouds. Figures in tandem appear in two of the canvases, twisted and conflicted between a place of contemplation and anguish. While in the subsequent four a singular, androgynous figure remains. Regarding the quote above by marine biologist and writer Rachel Carson, the artist portrays the edge of the sea as a space caught in light. It is a stage for reflection, earthly contemplation and where one might visually examine the concept of infinity. Lest we forget that before the voyages by Christopher Columbus when men looked out into the horizon they thought venturing to the edge would result in falling off into an unknown void. Somehow Schnabel’s paintings make an effort to find a place of balance in the concept of emotional infinity, gravity and our own daily struggle of keeping afloat. For this body of work she has employed several elements that are repeated in each stretched surface; jutting rocks, a vast sea, sky and a figure or figures. The ingredients are just that, as the artist often compares painting to cooking and experiments with these elements in search of the combination that will best suit her palette. When talking to her, one might even be at first shocked to hear her emphatically describe the texture of paint as a smooth, silky mayonnaise. The comparison likening paint to a condiment alone dictates the artist’s relationship to her materials, while her recipes evolve from dreams to painted surface. We recently met at the gallery to have a chat. Katy Diamond Hamer: Do you work with a visual reference or do images come from your imagination? Lola Montes Schnabel: It depends, a lot of it comes from my head. [Making a painting] is almost as if working as a jazz musician, you start with a couple of notes and then it usually ends up somewhere else. KDH: One of the things I was intrigued by and thought about post-opening, are the colors in the sky and how they are opposites. Yet in doing so was reminded of a sunset and how when the sky is bright with oranges and golds, it feels separate from the clouds which are completely contrasted shapes. How did you decide on this? It’s a very different palette from your last solo exhibition at The Hole Gallery (2011). LMS: [Most of the decisions materialized through my] love of cooking. There are moments when I am out, walking on the street and I think about something I want to cook, like merguez with roasted apples and red cabbage. I will think of color; a creamy white next to a forrest green. I’ll think about nutmeg and sage with pumpkin ravioli, putting together a aromatic (romantic) thing and I often think of assembling colors in a similar way. When I’m whipping up a color, there is a similar wrist movement [when making a dish]. The reason I love Francis Picabia (French 1879-1953) paintings is that, the paint looks so fresh, it’s as if you could eat it even after all these years. I kind of want my paintings to be lick-able. KDH: Since the paintings in this show have a similar feel and energy, I’m curious if you worked on more than one at a time or if you work on them singularly? LMS: For my last show [at The Hole, Love Before Intimacy, 2011] I worked on all of the works at the same time. This show I divided, doing two in the summertime and then the other four I painted together. I had a few works at Nada at The Hole’s booth, with Kathy (Grayson) and when they got back I felt like they needed to be reworked since the energy felt different post Miami and they didn’t have the same aura as the other four. I painted back into them right before the opening and that’s why we have scented candles in the gallery to try and mask the smell of fresh oil and turpentine. KDH: I noticed that at the opening! I actually liked the smell of the candles and realized that while squeezing through the crowd and getting close to one of the paintings that there was a particular shimmer and scent that made me realize it was still wet. It’s nice to be back in the gallery without the bustle of the opening although that was fabulous. I really like your figures and the more I look at them the more I see. LMS: I went to the Caribbean shortly after making the paintings and found myself in the landscape that I was making as if I wanted to stay in it while being away. Growing up in New York, you never really knew if something was [meant] for you or someone else. The rocks [in the first two paintings] are from Santa Fe, New Mexico, slabs and plateau’s versus the cliffs that I then witnessed in the Caribbean. KDH: There is an organic, almost human quality to the way that you paint rocks. I go back to the form and the malleability of shape and how it can be perceived as something it’s not. When I first looked at these paintings, I thought that the yellow represented sand or solid ground but for you it’s water. LMS: It’s a big dilemma how to paint the sky next to the water and in a way this is solves that for me. I’ve stared at water for so long and tried to capture the blobs of light that are moving [over the surface] and it always seems to me to be a digital pattern. I thought back to the way the red sea and the red desert were portrayed in film. I wanted to make a red sky relating back to [cinematic] titles that did not really present the image of a red sky or desert. It took me a really long time to not be clumsy and to own my sensibility and sense of self. So in a way this is about being androgynous, getting settled in your body and getting past this sense of physicality. I’m trying to get rid of the figure and in a way, this is how they will be slowly disappearing. In the past I worked with portraits and tried to capture the essence of a person rather than likeness and somehow it always ended up looking like them. I’ve tried to capture the element of hysteria. KDH: Painting a portrait is such an intimate process. LMS: It’s a healing process too. It’s as if I can think about a person and then they will have a dream that relates. I don’t want my joy to come from other things anymore. I see so many people walking around with sour expressions on their faces. Joy is based on what possessions you have or clothing, or a certain lover, or food that you eat. If you own what you enjoy you can have nothing and be in complete contentment, where a rock becomes your pillow. There is memory in all of these rocks around us, all these buildings [in Manhattan] are watching us somehow. KDH: Yes, there is so much history in the markings and structures of those who came before us. LMS: I often think about what is constant. Some of these rock formations and even the clouds are always changing. [But the rocks represent] stability and the clouds equal change. I think about being close to someone, looking up at a cloud where you can both can see the same shape in it. I love that feeling of not being obliged to say anything but achieving a certain level of communication. KDH: Your figures have a very subtle, slight resemblance to Francis Bacon was that intentional? LMS: I definitely was thinking of Francis Bacon (Irish-born British 1909-1992) but also Giorgio De Chirico (Greek-born Italian 1888-1978) and his figures, the scale and relationship to form. KDH: Did you spend a lot of time in Italy with your family while growing up? Lola Montes Schnabel, Passageway Between Here and There (Drawing 5), Gouache on paper, 24 x 20 inches, 2012, Photograph courtesy of Tripoli Gallery and the artist. KDH: They feel like they are very much about painting. LMS: I love painting! I love Bruegel (Dutch c.1525-1569) and i remember the first time I saw a Frida Kahlo (Mexican 1907-1954) painting at the Met. I stayed in front of a particular painting for 45 minutes. It [looking] makes you forget about time and realize that the paintings don’t belong to the museum they belong to your own experience and record of imagery. KDH: Regarding under-painting and technique did you start off painting everything yellow? LMS: In some of them I did, but not all. I didn’t want to get too fussy with the details and I’d rather allow a blob to represent a symbol or metaphor versus something that is a direct representation. There is something about our generation where you reach a certain age and you aren’t where you thought you’d be or don’t have the body that you wish you had. I have friends from the ages of 7 to 90 years old, but so many people of our generation are really struggling with their own identity. I think about being a kid and sitting in a sunny spot near a window letting the sun pour in and warm my body. I feel like everyone has a memory like that. KDH: That is such a good feeling. I had a similar experience the other day actually, in my apartment, south facing light streaming in. Let’s talk about the drawings. LMS: I’ve been drawing since I was a little girl. The paper I used is diploma paper from Italy. It has a waxy quality and the gouache is made by Kramer pigments. It isn’t watercolor paper so the pigment sits on top. Each drawing starts out [in a particular way] and then becomes something else. A natural hallucination. KDH: So these have all been made pulling from your own experience, subconscious and vision? There seems to be a focus on invention of landscape or the rendition of fallacy within the context of space. LMS: I didn’t want too many faces since I”m trying to get away from the figure and eyes looking back at me in my work. I still found things [shapes] that became something else; animals, a bunny rabbit, a rooster. KDH: The detail on the paper, small, colorful, printed flowers, is pretty and quite decorative. LMS: Yes, and it also allows me to focus on using broader strokes and less detail since it’s already there. It’s so different then working on a normal piece of paper. It reminds me of a cartoon from the 1930s and the frame being made by ribbons and birds that make an entranceway into a world. KDH: There is a sense of environment and abstraction intertwining which leaves a lot to the imagination of the viewer. You can tell that you have fun making these. LMS: I do. My perfect day is to sit at home drawing, while having something cooking in the background. I love using clay pots, baking a pumpkin, drawing and listening to records. That is a perfect day for me. I love drawing and painting and I feel like in making paintings it is an open dialogue with the past but also leaves messages for those to discover in the future as well. KDH: I can see why Francesco Clemente would be important to you, I’m glad he got to see the show. I believe in art history and allowing people to have access to knowledge of the past that they can then make specific decisions about their work whether choosing to remember the past or forget it. A 2008 graduate of Cooper Union, in New York, Schnabel was rejected a few times, then finally used her mother’s maiden name before getting accepted. She walks a line between the being the daughter of a celebrity artist (filmmaker/painter Julian Schnabel) and a woman who is seeking information about herself and her world. Lola Montes Schnabel has many influential mentors who she has sought out while others by chance, have come to her. René Ricard recently said that her paintings, in their revolving format, are like the arms of a clock. From what has been installed at Tripoli Gallery Pop-Up along with previous work, one thing is clear; as an artist she not only has the ingredients but also the patience and desire to experiment with until just the right course is made or taste discovered. Sustenance is not granted by food alone. 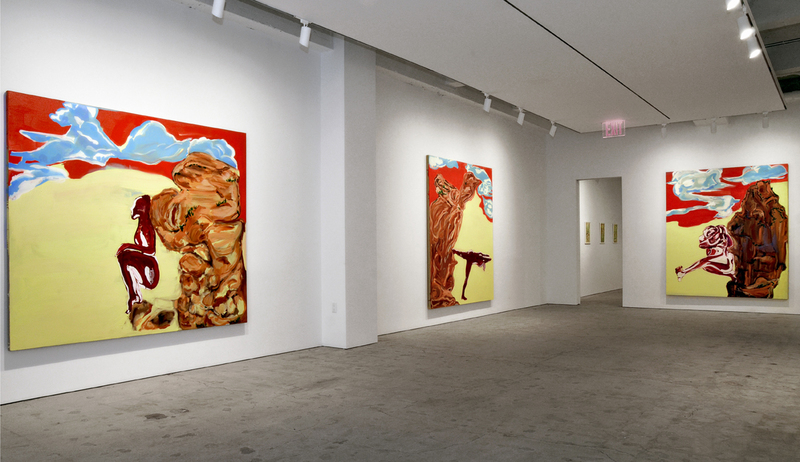 Lola Montes Schnabel: Within Reach is on view at the Tripoli Gallery Pop-Up until February 11th, 2013, 980 Madison Avenue, 3rd Floor., New York, New York.